A helicopter vroomed across the sky….my kids ran out screaming in excitement to spot it. We saw it flying towards the hills becoming smaller and smaller as it eventually vanished in the horizon. The sky is cloudless and azure. We are in the autumn ….almost. 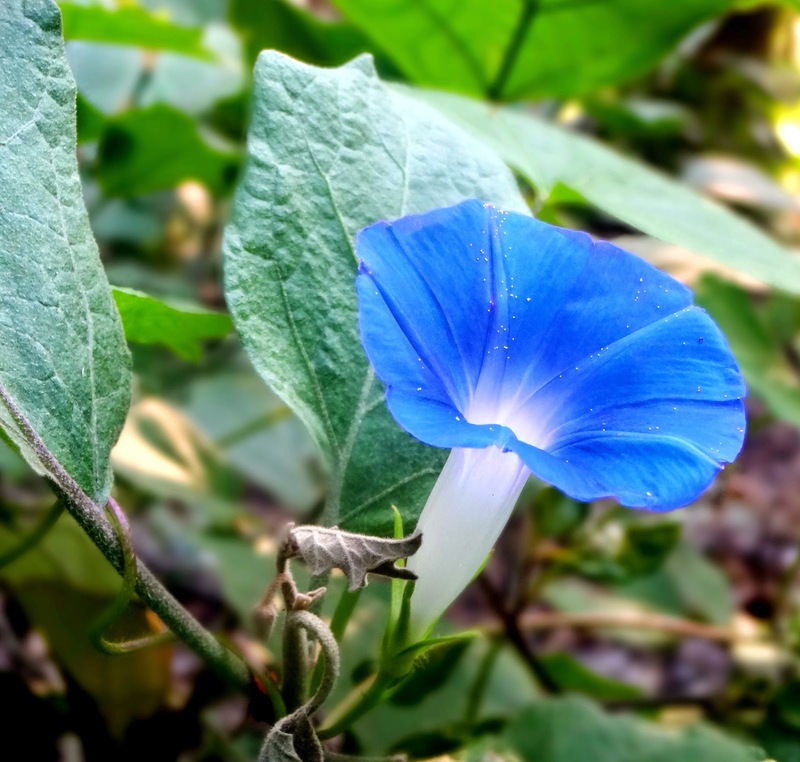 Delicate flowers of Morning Glory dot the landscape. They wither as the Sun gains strength. 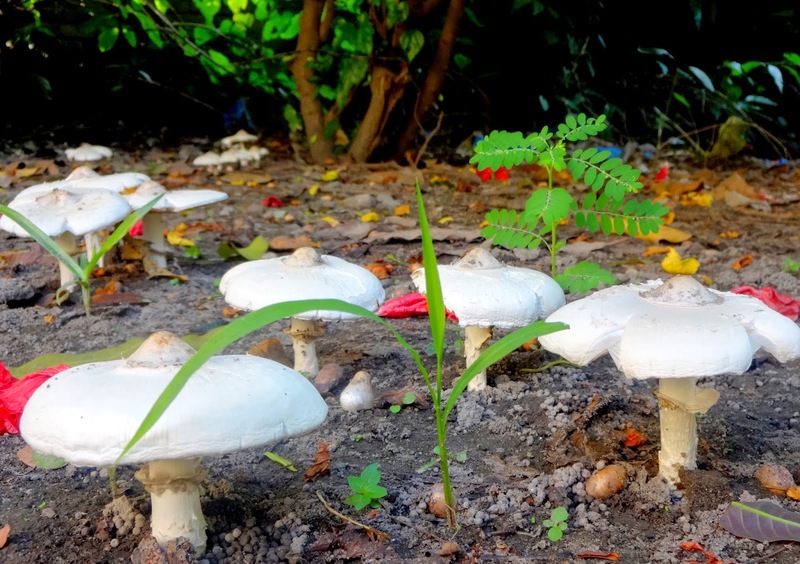 My son discovered some mushrooms under the Gulmohur tree. He is amused by them and knocks down a few with a stick. 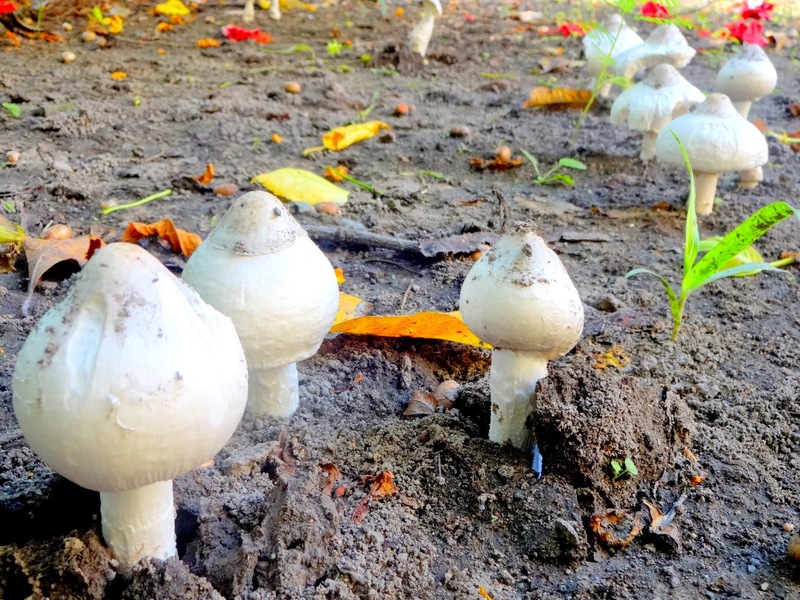 By evening, the mushrooms open up completely and look like tiny umbrellas. My daughter has been requesting me to bake a cake. And I readily go ahead. I have decided to bake a cake sans eggs and butter. A whole wheat vegan chocolate cake with a cupful of homemade beet wine is ready to go into the oven. A lovely aroma wafts through as the cake reaches the final stages of baking. Original recipe uses red wine. I used homemade beet wine in the cake. Our wine had cinnamon and cloves and this lent a lovely flavour to the cake. The recipe asks for strawberry jam. I used homemade Cape GooseberryJam. 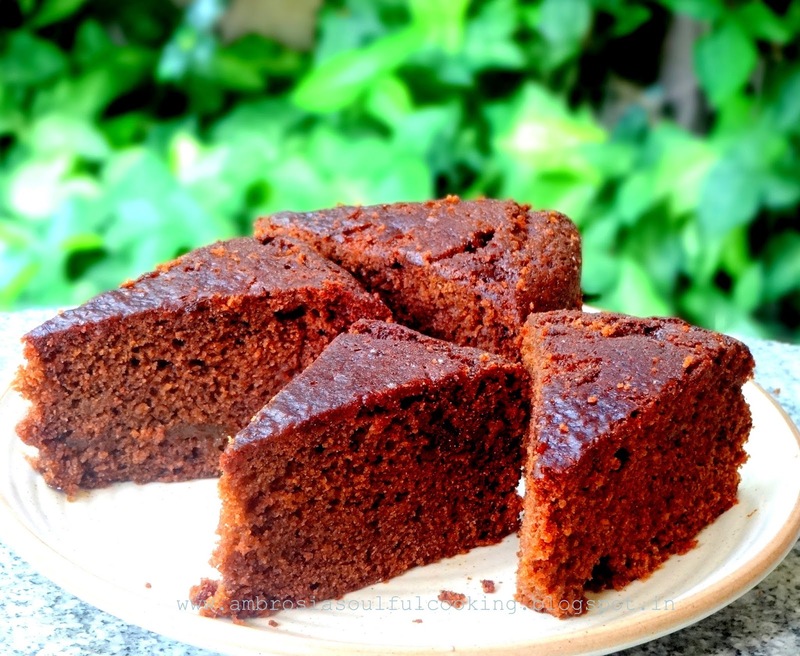 The cake was moist, chocolaty and flavourful. Pre heat oven to 180 degrees C. Line and grease one 6 ½ inch round cake pan. In another bowl, mix the wet ingredients and sugar. Now add dry ingredients to wet ingredients and stir gently till well combined. Do not over mix. Pour the batter into the prepared pan. Bake for 50 -55 minutes or till the cake shrinks from the sides and a skewer inserted in the center comes out clean. Remove from the pan after 5 minutes. Cool in the rack. Slice next day. My notes: I had homemade beet wine and I used it in the cake. You may use red wine. I used Cape gooseberry jam I had. I guess any fruit jam will do. Marmalade would add a great flavour to the cake. Amazing photography, loved your presentation. I happened to visit your blog while searching for a recipe and have been glued on to it since the last two hours. Will surely try this cake out and let you know the results. 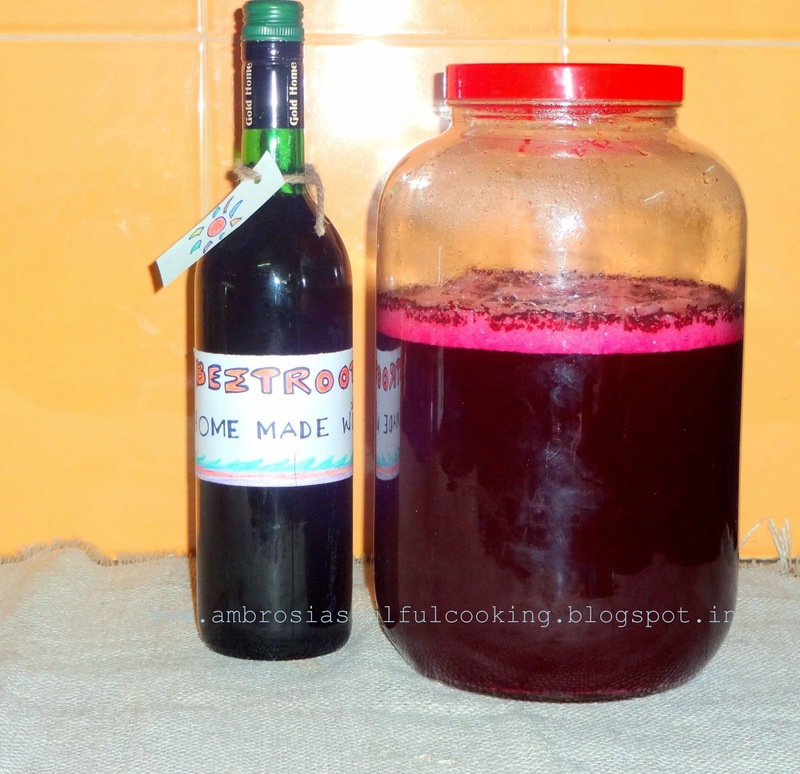 Request you for the beet wine recipe as well. Sounds very interesting. Hello Asha, it gives me immense pleasure to know that you liked my blog. Yes, please do try this cake. It comes out moist and flavourful. I will surely post the beet wine recipe. We made two batches - One plain, another with cinnamon and cloves. Both were good. I used the latter for the cake. I chanced upon yur blog via a Google search and now am an avid fan! I've subscribed via email so as to not miss a single post and love the way the recipes I've tried have been *epic fail NOT*thanks to yur instructions. Btw-wud u please add in a search box plz. Hi there! Thank you for visiting my blog and trying the recipes. This gives me greatest pleasure. Yes, I will surely add a search box in my blog. Thank you for your suggestion. Love and best wishes! 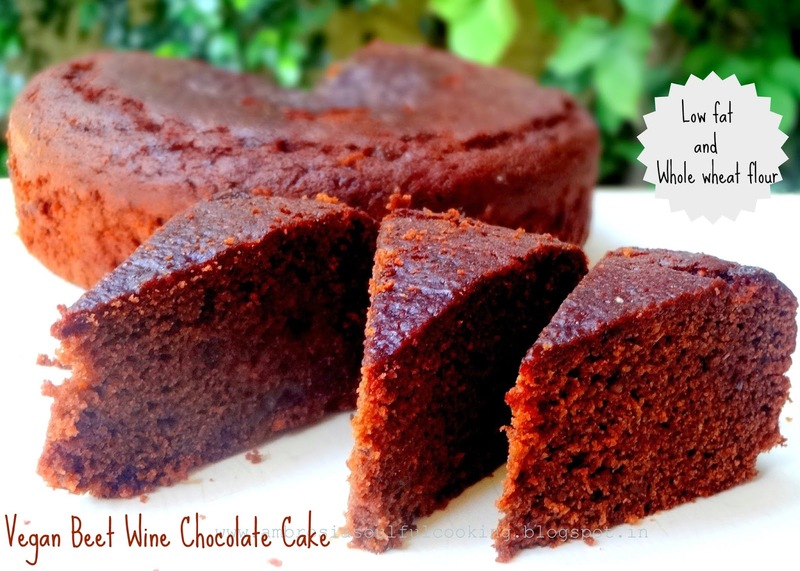 This cake looks so moist and delicious, I cannot wait to make it. 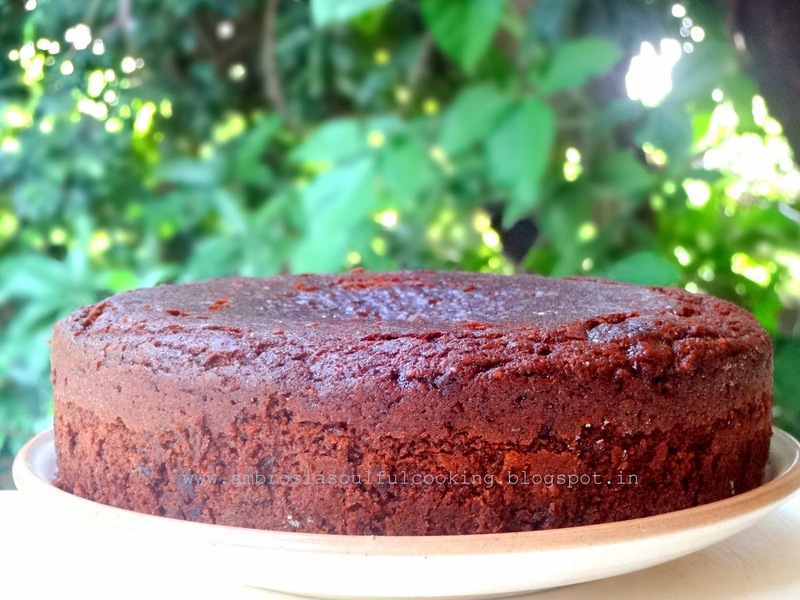 Please share your beet wine recipe; I am waiting for it to make this scrumptiously looking cake. Hello Una, Sure I give give you the beet wine recipe soon. My husband made beet wine. It did the magic in the cake. I shall be giving you the recipe soon....that's a promise.